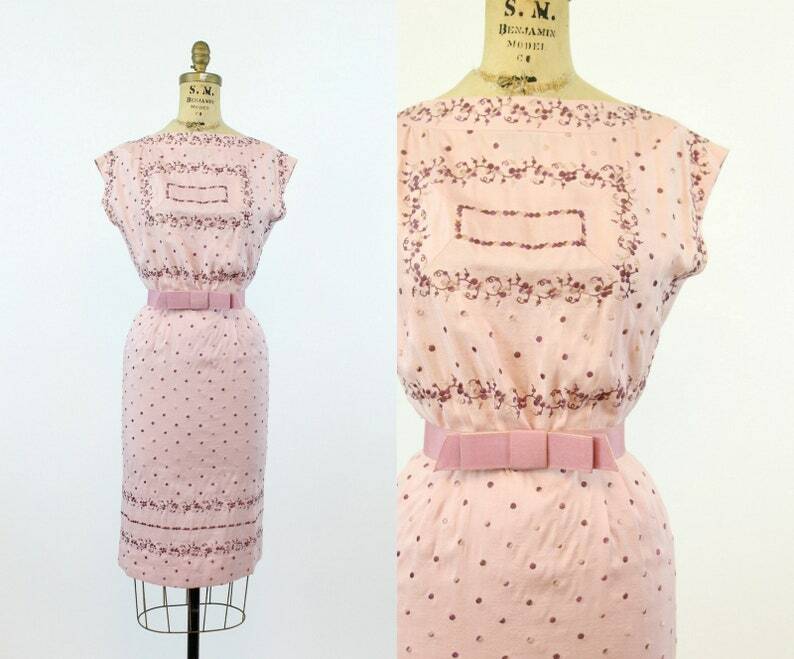 Sweet and demure 1950's dress! Done in a vintage mauve shade of raw silk with embroidery done in gradients of purple. The embroidery is of grape vines that frame the front of the bodice with squares, run vertical down the back, boarder the hem, and then a pattern of embroidered gradient polka dots on the skirt. Bateau neckline and cap sleeves, bodice has a slight blousy fit, especially when belt is fastened. Wiggle dress fit. Bodice is unlined, skirt has a soft tulle lining. Back metal zip. Condition: Excellent Vintage: one small interfacing mend mostly on the inside of the right arm hole( see 6th photo) there is some very light underarm discoloring, the discoloring under the right arm is mainly on the interior. The belt is a tight fit with the waist of the dress, most likely the dress is meant to fit slightly loose and the belt would cinch giving that blousy look. Could easily be worn without belt.